The most important thing to understand about the Trump administration’s proposal to eliminate the Departments of Education and Labor and merge their existing functions into a new “Department of Education and the Workforce” is not that it’s a decades-old idea touted, but never seriously pursued, by congressional conservatives. Even though it is that. Soon after gaining control of both the House and Senate in 1994, congressional Republicans, led by Newt Gingrich, floated similar proposals, but never, tellingly, brought them up for a vote. (There’s little chance that things will be any different this time around; the U.S. Department of Education is not the most popular federal agency, especially under the current secretary, but voters nonetheless have consistently opposed its elimination). And no, the most important thing to understand about the proposal also isn’t that it’s bad policy. Even though it’s that as well. Back in 2016, the Center for American Progress Action Fund published an analysis of what President Donald Trump’s proposal to eliminate the Education Department would mean for students, from pre-K through college. Even if you don’t believe that all of those things would necessarily happen under the plan the White House rolled out last week — and, ostensibly, most of them would not — the report underscores what’s at stake in deprioritizing many of the important functions the department serves now. And no, the proposal doesn’t make any more sense politically than it does substantively, especially for conservatives. Republicans have been gunning for the Education Department since President Jimmy Carter spearheaded its creation in 1979, in part because they perceived it as a giveaway to the national teachers unions. There is truth to that, although the actual story is somewhat more nuanced. But regardless, if one considers organized labor a political opponent on education, why give them home court advantage by merging Education with Labor? No, the most important thing to understand about Trump’s bid to merge Education and Labor is that it’s political theater with two purposes: Appeal to his base and distract everyone else from more salient, and urgent, issues. Because the truth is that the dismantling of the Education Department is well underway, especially when it comes to what historically has been its most important mission: leveling the playing field for those being hurt or shortchanged by state and local policymakers. While most everyone yesterday, like the Black Crow that Joni Mitchell sang about, was diving down to pick up the next shiny thing, a new report by ProPublica on the Education Department’s retreat on civil rights issues went largely unnoticed. Their findings, which the department does not dispute, reveal that, regardless of the area of complaint — be it around race, English language learners, students with disabilities, sexual harassment, or violence — plaintiffs are increasingly losing out to the very public education system in which this administration says it otherwise has so little faith. ● “Under former President Obama, 51 percent of cases that took more than 180 days culminated in findings of civil rights violations, or corrective changes. Under the Trump administration, that rate has dropped to 35 percent. ● “70 percent of complaints of discrimination against students with limited proficiency in the English language were upheld under Obama, compared to 52 percent under the current administration. 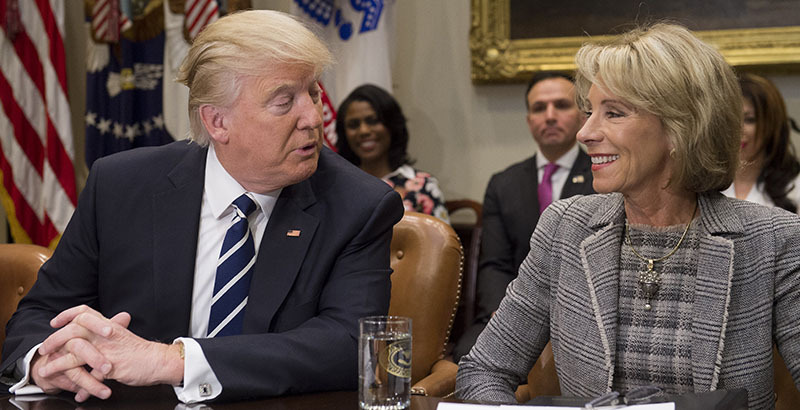 Despite the fact that the Education Department already has far fewer employees than any other government agency, it has shed more than 500 workers — 13 percent of its total staff — since Trump assumed office a mere 18 months ago. And some of the biggest losses are concentrated in the Office for Civil Rights, which has lost nearly 70 staffers, or about 11 percent of its workforce. Congress tried to send a message to the department by increasing OCR’S 2018 budget back in March. But it’s questionable whether any level of staffing will make a difference at the department given not just a lack of concern about civil rights issues but what seems to be willful ignorance, as most recently displayed in Secretary DeVos’s debate with members of Congress over the rights of immigrant students — rights she only begrudgingly conceded after a string of crystal-clear legal decisions, Department of Homeland Security policy clarifications, and the happenstance of having to testify at back-to-back congressional hearings. It’s tough for education advocates to stay focused at a time like this, existing in a climate where the outrageous and ridiculous have become the daily norm. It takes some discipline, and even this author couldn’t resist the opportunity to knock the “Department of Education and the Workforce” around just a little. But we must find a way to see beyond the day’s shiny new distraction. Because what’s most imperative for all those who care about what has always been the Education Department’s most important mission, the equal opportunity of every child to receive a fair and appropriate public education, is to remain focused and to work together in the face of our most significant challenges in half a century.